Over the past five decades, leftist muckraker Barbara Ehrenreich has carved out a niche for herself as one of the nation’s most acidic and trenchant social critics. Fortunately, she is also among the most intellectually curious and entertaining, asking all the hard questions and recording the answers with wry chagrin. A comparison to H. L. Mencken might prove in order—if Mencken had held a Ph.D. in immunology, given birth to two children, and championed democratic socialism. Her best-known earlier works include Nickle and Dimed (2001), an immersive exposé of working class hardship, and Bright-sided (2009), a send-up of the “positive thinking” craze. In Natural Causes, she brandishes her stiletto against the body of evidence behind the contemporary wellness movement and leaves a rather bloodied carcass in her wake. The central tenet underlying Ehrenreich’s contrarian analysis of everything from the annual medical checkup to corporate-sponsored meditation is universal mortality. Not that Ehrenreich is the first observer to note that we are all going to die—readers might find hints of this augury in the poetry of Philip Larkin or old recordings of Lenny Bruce. Rather, starting with this premise, Natural Causes interrogates the many illogical and unscientific practices embraced by western society to forestall or even defeat impending death. 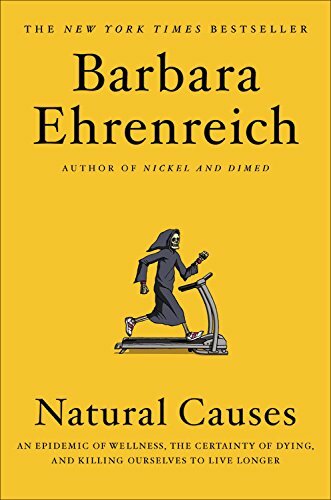 The sharpest and most persuasive of Ehrenreich’s critiques dissects the twin fad of excessive exercise and so-called “mindfulness” that have enveloped this nation’s professional and managerial classes in the past several decades. Flabbiness, according to Ehrenreich, is associated with limited career advancement, while employees are subjected to “coercive and overly intrusive” wellness programs that actually add to workplace stress. Efforts to tame the psyche through “mindfulness” appear even more suspect and deleterious than those designed to sculpt the body. The mindfulness cult’s origins may lie in Eastern religion, but these have been channeled through Silicon Valley, whose high-tech firms promote dubious in-house programs like Google’s “Search Inside Yourself” agenda. Natural Causes also tackles more traditional forms of preventive medicine. Ehrenreich questions the structure of a medical education system that drains the trainees emotionally and depersonalizes the physician-patient experience. She targets the annual physical examination—questioning not only its utility, but also challenging proponents like Stanford University’s Abraham Verghese who defend the practice as a ritual “‘that most patients expect.’” She pointedly questions the value of routine screenings like mammography and colonoscopy. The value of Natural Causes lies not in its particular critiques, some of which will likely age better than others. (For now, this reviewer still plans on getting a colonoscopy.) But Ehrenreich has a gift for enabling readers to recognize their own blind spots—to call into question the very foundations of the ordered universe in which many of us believe we live. She is neither a Luddite nor a Sidney Spritzer-style heckler. Instead, she is an actively engaged critic—the lioness roaring in winter—pointing out our folly in the hope that we may lead richer lives. “The only cure for bad science is more science,” she writes. That, and of course, maybe some whetted barbs from the grandstands. Jacob M. Appel's writing on bioethics and health sciences has appeared in such publications as Journal of Clinical Ethics, Journal of Law, Medicine & Ethics, and Bulletin of History of Medicine. He has published in news outlets such as The New York Times, The San Francisco Chronicle, The Detroit Free Press, and others. His nonfiction is also a winner of the William Faulkner-William Wisdom competition for creative nonfiction.